Teleporting objects, especially Bad Guys is pretty simple. However, here are a few things you do not want to teleport and why. Vehicles - A teleported vehicle will blow up if teleported and then respawn at the initial placement point. Objective Bad Guys - First of all, "Objective Bad Guys" should never respawn. Teleporting some "Objective Bad Guys" has the same affect as a respawn. If you have properly stacked your events and are ending the game and an "Objective Bad Guy" has been teleported and is still alive, the game will consider the objective that this "Objective Bad Guy" was a part of "STILL OPEN" and the game will not end until he is located and killed. This could mean going through every objective area to find the teleported "Objective Bad Guy"
Bad Guys Attached To Emplacements - Don't try to teleport a Bad Guy and the Emplacement he is attached to. He will either not reattach or will attach and not fire. If you are going to teleport an attached Bad Guy, vaporize the emplacement he was attached to. The same is true for Bad Guys attached to vehicles. 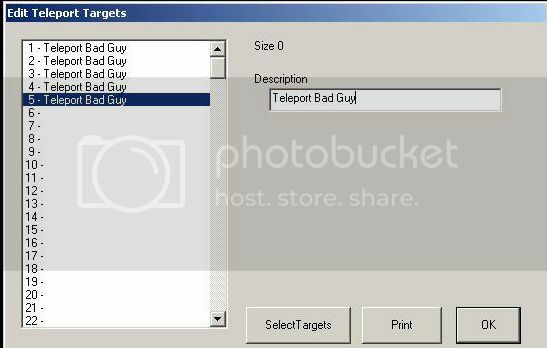 Each "Teleport Target" has to have a name. Follow these steps to name a Teleport Target Marker. The window pictured below will appear. Enter a name in the Description Box and click OK.
Next, go into the Insert Mode and place a Teleport Target marker on your map terrain. It is shaped the same as an area trigger marker except it is blue instead of orange. The 2 windows below show the set up. The next step is to assign a name to the Teleport Target marker. To do this, click on the text at the bottom left of the editor's window to bring up the Item Attributes. Under Waypoints, select the name you assigned earlier. While in this window, set the Team to Evil [Red]. The final step is to create an Event to make this happen as shown in the example below. Multiple Teleports follow the same basic guidelines explained above.